After playing in Sigisoara we made a quick visit to Bratca, a large village in Bihor County, in Transylvania. 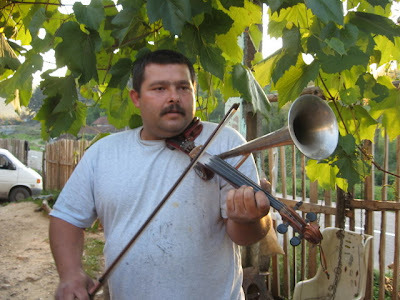 As I wrote, we won't be able to visit the market at Negreni (Fekete To) next weekend so we dropped in on Mircea Rostas, who is a maker of the trumpet-fiddle hybrids known as vioara cu goarne. The visit turned into a session of learning how to construct these folk-level resonator fiddles, and in the near future I will post a full documentary series of photos about how they are made. 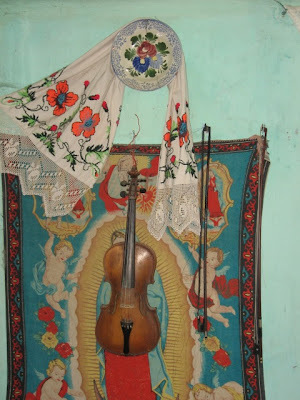 Mircea, however, had grown his beard in mourning (as is the Gypsy custom) for his recently deceased brother, so he wasn't in the mood to play as much. 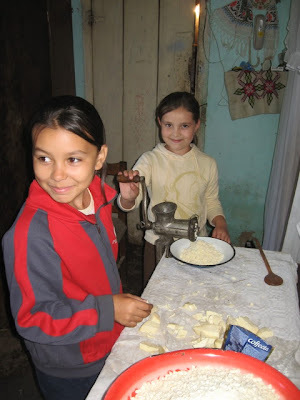 We arrived in Bratca as the Rostas family was inviolved in some furious cheese grinding. 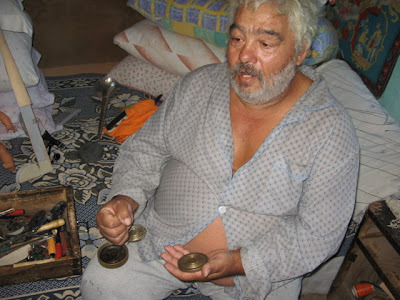 A huge wheel of hard salty cheese was being cut up and forced theough a grinder, and then jarred for later use in mamaliga cu brinza. This wasn't brinza, however, but sheep kash. 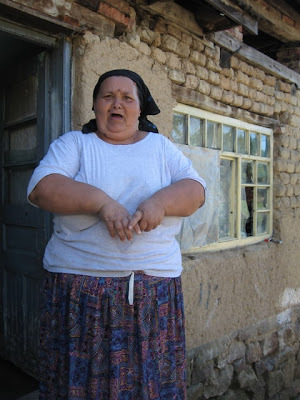 There are a lot of Slovak settlements in the higher mountain villages of Bihor, and we were surprised to learn that Mrs. Rostas was raised up here in the mountains speaking Slovak, although she has forgotten most of it. We had to head back to Cluj so we took the road that runs between Oradea and Cluj. Just as the road rises into the mountain passes there are a series of road houses serving food aimed at long haul truck drivers. We stopped at the Perla, one of the first on the approach from Oradea. Remember what I said about Transylvanian cuisine being focused on quantity? 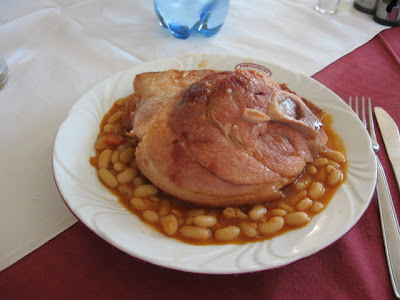 Here is the most expensive menu item, 6 Euros, smoked ham hock and beans (ciolan cu fasole) and draga mea, it was good. I added a few new videos to my youtube user page... including this, with Nicu Rostas.